. . . this article from The Tyee shows why BC’s electoral/political/governance system is one of them (Hint: Canada’s is another). While many well-intentioned people such as Stephen Lewis, Stéphane Dion, Elizabeth May and many others have worked, and continue to work to effect change from within the political system of our country, I believe these efforts are yet another case of “Too little, too late”. A very good explanation of why we cannot control the complex systems that we encounter (both natural and man-made) can be found in Thomas Homer-Dixon’s book “The Ingenuity Gap“. Since our broken political systems are of our own making, we have the ability to remove and replace them with up-to-date ones carefully designed to meet the challenges of current reality. However, in order to do this we would have to break the bond between the existing systems and the actual sources of power within our societies. In the past, this has meant all-out revolution and has resulted in the fall of the Empires of the time. Perhaps this is the only way to effect change of this magnitude . . . but perhaps there could be other ways. If in fact, there is no other way than violent revolution, and if every political party finds it necessary to do the kind of negative advertising and campaigning the NDP tried to stay away from in May 2013, I will join the half of the citizens who do not participate in any way, including by casting a ballot. I will not do this out of apathy but out of a deep contempt for those to whom this negativism appeals and a conviction that it would be wrong to support any system of governance on their behalf. As I have read through a stack of books in the last two years about the on-rushing convergence of crises threatening Earth and all complex life forms, I kept bumping into half-remembered discussions from forty to fifty years years ago. Discussions fogged at the time by alcohol and smoke and dimmed over the years by the hectic pace of life, a plethora of perceived priorities and a subconscious wish to forget. Discussions birthed from ideas in books like Silent Spring, The Population Bomb and The Limits to Growth. Similar discussions among those a few years younger may have compelled them to settle in the West Kootenays area around Nelson, on Lasquiti Island and in resource-based villages in BC that had used up their resources. They essentially dropped out of the up-tight world of careers, corporations and country clubs to live a simple, organic, back-to-the-land lifestyle. Many young Americans, angered by their country’s growing imperialist ambitions and dysfunctional political system opted to escape by coming north and adding to the bucolic landscape of the youthful, “hippy” counter-culture movement of these areas. Predictably, the warnings about using up Earth’s resources and the dangers of chemical contamination were vigorously fought against by the corporations who were carrying out the destruction and discounted by government and the mainstream media. Forty years later, much has changed, but not for the better. Governments in the so-called ‘developed’ world are, to all intents and certainly all purposes, now owned and controlled by corporations who can afford to buy whatever it takes to get them elected. Corporations, which exist for the sole purpose of generating profits for their shareholders, get whatever legislation they need to maximize those profits enacted by their puppet legislators. Corporations are even insisting they be treated as human beings with equal rights and protections against anything that might harm their well-being (profits). These factors allow corporations to operate at will, defying environmental protections, funneling public money that should be providing social services into private bank accounts and demanding cutback of any regulation, or even monitoring, of their operations. Any semblance of democracy has long since been abandoned as the resulting governments gut environmental protection, cut regulatory staff, silence their own scientists and spend the citizens’ tax monies on advertising to assure us that they will create enough minimum wage jobs for each family to have the three that are necessary for survival. All the while, the Global Climate Change Elephant, first discovered and described in the mid-ninteenth century, sat in on these discussions, corporate board meetings and legislative sessions, patiently waiting to be brought into the conversation. Now it has lost that patience and, with a parting “Thank you, thank you very much”, left the room and is making its presence felt by melting arctic sea ice, releasing methane and carbon dioxide by thawing permafrost, warming and acidifying the oceans, strengthening hurricanes and tornados, and intensifying both droughts and flooding. Still the denial and obfuscation continues by corporations, governments, pseudo-scientists and mainline news media. Still we sit idly by and watch the consumer culture show, clapping and hoping for yet another encore. “Well folks, the show is over and Elephant has left the building . . . goodnight”. Land, Sea, Air – which should we lose first? While most people who read this post will be cognisant of the damage being done by the continued extraction of bituminous hydrocarbons from the Alberta tarsands, let’s for the moment assume it will continue and that an export route involving a pipeline to the west coast and tanker traffic to Asia will be established. Immediately, we see two distinct and ominous possibilites for catastrophe in British Columbia; the probability of a ruptured pipe spilling oil into pristine fresh water resources and fish habitat and the just as probable threat of destruction of the coast by another tanker accident. There is, of course, a third disaster to be caused by this corporate infrastructure. Let’s say that this pipeline is built of kryptonite or, being blessed amongst pipelines, enjoys heavenly immunity. Likewise for any tanker which enters Canadian waters off the coast of British Columbia to load the issue of the pipeline. 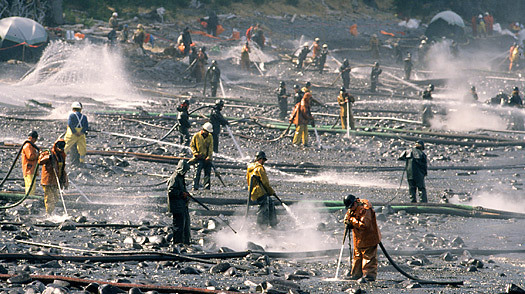 This would ensure that the lands and waters of British Columbia would remain safe until the pipeline’s owner, the oil industry and the applicable foreign investors were satisfied that they had made a fair profit and it was time to safely decommission and un-install the pipe for recycling . . . right. But what about the emissions from all the “product” that made it “safely” to “market” and was burned? This would almost certainly be the worst result of all as it would not only hasten the end of civilization and the human species, but just might be enough to be the sole cause. So, it seems the best possible outcome would be a catastrophic rupture of the line on its first day of operation, anything else would be far more dangerous. The Long and Short of it . . . The title of American novelist James Howard Kunstler’s book about the approaching catastrophe of global climate change say’s it all – “The Long Emergency”. The approach is slow but inexorable like a giant cruise ship that loses power as it heads toward a rocky shore. However, anyone watching from shore would see the moving ship and, if they had a modicum of knowledge of the physics of momentum, would realized the ship was not going stop in time. Taking hours from start to finish this would be a “Short Emergency”. Another analogy would be Hollywood’s usual approach to the impending end of humanity, that of a large object such as an asteroid or comet discovered to be on a collision course with Earth within a couple of weeks from impact. This, of course, would be another “Short Emergency” with a duration of weeks and the end coming literally in a flash. Earthlings would have a magnificent feel for what was about to happen as the object (with a bit of help from the FX crew) would grow hourly in both apparent size and brilliance as it took aim straight at the observer, almost certainly in contradiction of the laws of orbital motion. In contrast, the “Long Emergency” of climate change will take decades, or generations, or possibly a century or two and the changes will become undeniably apparent to various people only after the passage of decades or even a lifetime. Even though a wealth of data from scientific investigation is available now to form an extremely well-informed and unambiguous decision that anthropogenic climate change is real, there are still those who refuse to think about it. If you only think about what will happen if we collectively refuse to face reality, then it is a picture which anyone could be excused for being unable to bear looking at. The real tragedy of climate change is that it need not cause the extinction of our species if we would face the reality and resolve to begin immediately to make the changes necessary to decrease or remove the causes. We are facing the very real possibility that we will continue to play Russian Roulette until we finally find the right chamber to fire. Why Canada should ignore Donald Trump the USA and everyone else too. What’s Blocking Sustainability? Why is the world sleepwalking into global ecological crisis? A New Look for a Dawning New Age?